This month we have a beautiful floral theme for you! You can show us either a single flower or a bouquet. The choice is up to you. I hope you find time to join in the challenge. For my inspiration I’ve made an Art Journal page. My house is on the market at the moment so the words on this page are about practicing patience! The stamps used are Entomology and Flower Garden from Stampers Anonymous. The stencils, mini cell theory and harlequin, are from TWC and the paints are Dina Wakley. The technique is one that I’ve developed by bouncing off another technique. It is super fun and easy to do! How is that for a teaser lol. There will be more about it in future posts. I’m a little bit addicted to it at the moment so I’m sure you will see me use it a few times. The girls at FSC have come up with some inspiring and very different takes on this theme. Please pop on over and check out their awesome creativity, be inspired and maybe join in the fun. Ink Art Designs is our sponsor this month (that’s my Etsy shop) and has a gorgeous stamp set to give away to one lucky winner chosen by random org. We also have a top 3 chosen by the design team and Saturday Spotlights where we showcase inspirational makes. And the icing on the cake is that each month we will be having a guest designer chosen from the entries. Wow, Dot, that looks beautiful. I like it very much. Have a nice new week. Those flowers really pop against your background, and I’m looking forward to hearing about your ‘new’ technique. you have created a wonderful card, I like the blossums an the background, a brilliant arrangement. Click HERE to see a lovely card tutorial using the Bokeh technique. Feel free to subscribe to this blog for the latest posts. 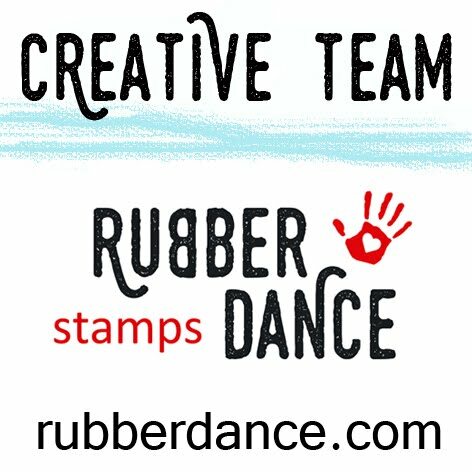 I am excited to be part of the Rubber Dance Design Team!